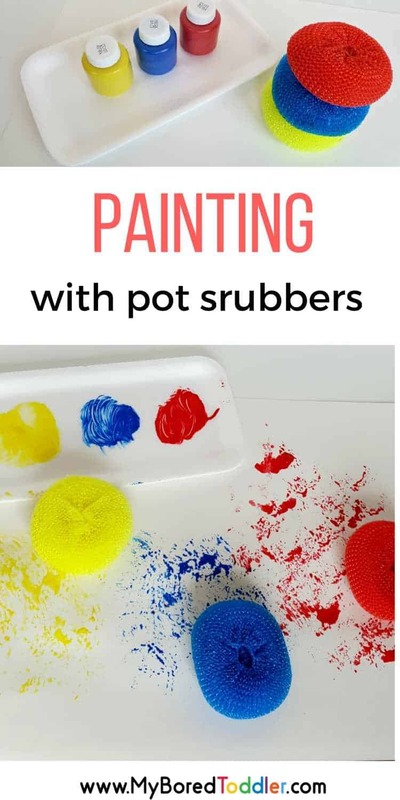 Painting with pot scrubbers is such a cheap and easy activity to set up. Painting is the perfect go-to activity for toddlers and there is no need for any expensive tools. 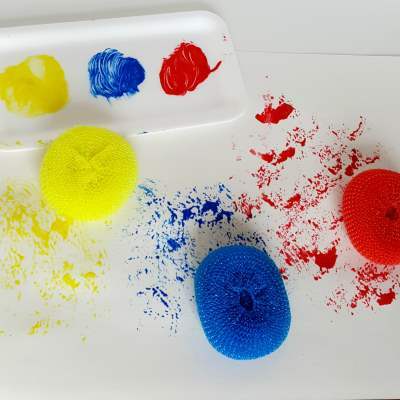 Toddlers will love painting with these textured pot scrubbers that add sensory fun to their painting experience. 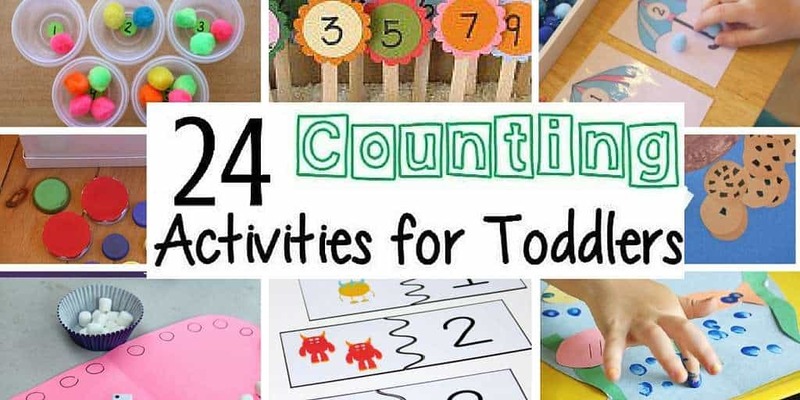 Toddlers love to explore hands-on with as few rules as possible! Process art experiences are especially beneficial because they allow freedom to create with little instruction and simple materials that are easy to use. This painting activity might lead to finger painting so be prepared with paint shirts and drop cloths! We love this drop cloth from Melissa and Doug. 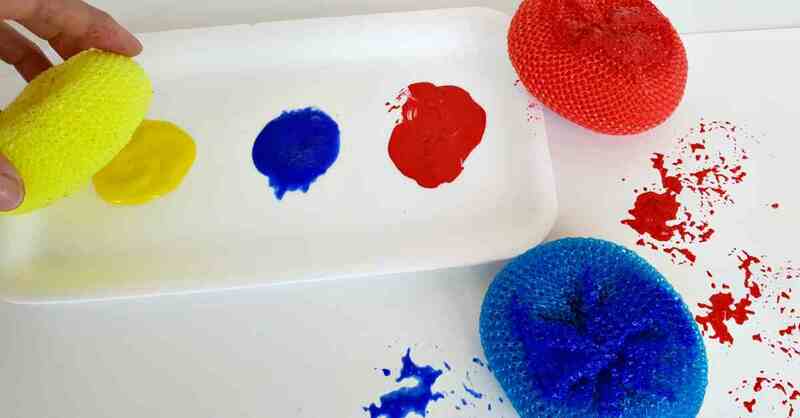 Washable paints – we really love these ones! Large sheets of paper – I like to use butcher’s paper. 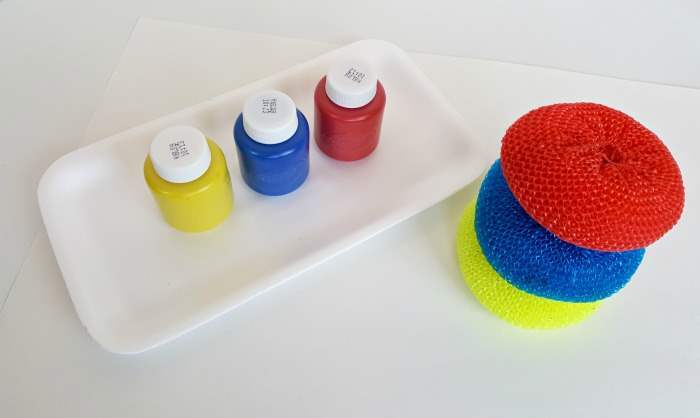 The pot scrubbers are easy for kids to handle, and they’re washable! This makes them fun to use over and over for painting activities. As you can see by the photo, they are also fun to stack! 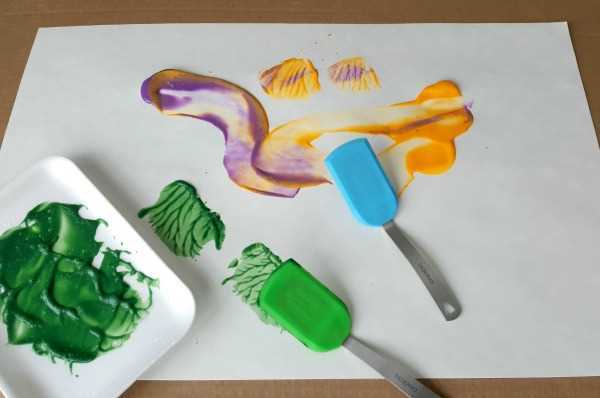 Kids will need lots of room to stamp and swirl the pot scrubbers so we chose large sheets of paper for this activity. Another great option for a canvas is a large piece of cardboard. You’ll love the added benefit of recycling disposable material! We matched the paint colors to the scrubbers for an opportunity to explore colors – sorting and matching, and mixing colors. You can put each color in a separate tray, or put two or more colors side by side to prompt color mixing. Red, blue and yellow are vibrant on their own, but also perfect for mixing together to make new colors. 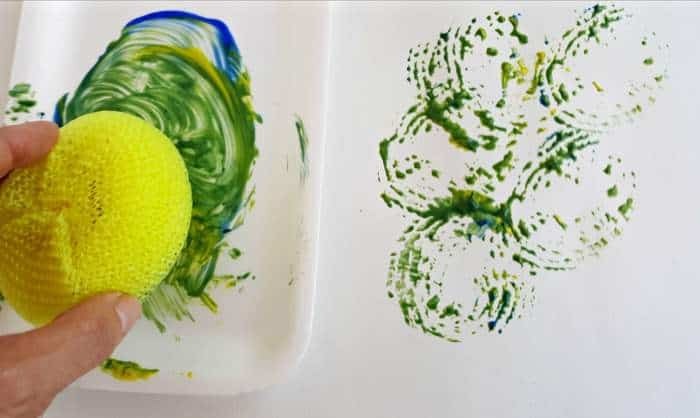 Build conversation with your toddler throughout the activity: name the paint color your toddler chooses; ask if he is matching the pot scrubber to the paint color; count with her as she stamps the paint onto the paper. Show your toddler how to swirl blue and yellow together to make a different color. Use stamping motions or swirling motions to transfer paint onto the paper. Bright paint colors and a blank canvas provide the perfect invitation to create. Dip! Stamp! Swirl! That’s all it takes for toddlers to have fun creating masterpieces that are ready to frame when dry. Enjoy this fun painting activity with your toddler!